Nominations close Friday, for the September 23 Grade 1 440 yard Albuquerque Fall QH Championship. ALBUQUERQUE, NM—SEPTEMBER 12, 2018—Horsemen are reminded that nominations for the 440-yard, $300,000 Albuquerque Fall Quarter Horse Championship (G1) at Albuquerque Downs close on Friday, September 14, at 5 p.m. (MDT). This year’s Albuquerque Fall Championship, presented by South Point Hotel & Casino in Las Vegas, had its inaugural running in 2015, and this year it will be run as a Grade 1 stakes for the first time in its short history. Past winners include AQHA world champions JRC Callas First (2015) and Jessies First Down (2017). There is no nomination fee, a $3,500 fee to pass the entry box, and a $6,000 fee to start. 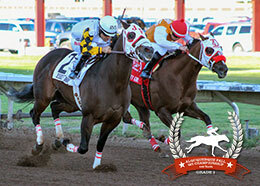 The winner will earn $165,000 and a berth to this year’s Championship at Sunland Park (G1) at Sunland Park Racetrack. For more information, contact the Albuquerque Downs racing office at (505) 266-5555, ext. 7609 or 7610.